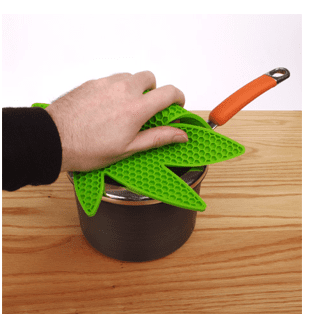 So, what you've got here is a pot holder that LOOKS like a pot leaf! Pot ... pot. Hilarious! Long after the novelty of this aptly-named product wears off, you'll be enjoying its quality construction and convenience. Made of 100% Silicone. Dishwasher safe. Safe for temps up to 500¡F/260¡C.